And that is that she's just a service member like any other, says Petty Officer Second Class Megan Winters. By attending the State of the Union address tonight, Navy Petty Officer Second Class Megan Winters hopes to show she’s just a service member like any other. However, to Donald Trump and his administration, she’s not just any service member, because she’s transgender — and the president is trying to kick out thousands of troops solely because they are trans. Winters will be attending the State of the Union as the guest of U.S. Rep. A. Donald McEachin, a Democrat from Virginia. She’s one of six trans military members attending as guests of senators and representatives in a rebuke to the trans military ban. “It’s honestly a privilege just as a service member to be allowed to attend the State of Union address, let alone a transgender service member,” Winters tells The Advocate. 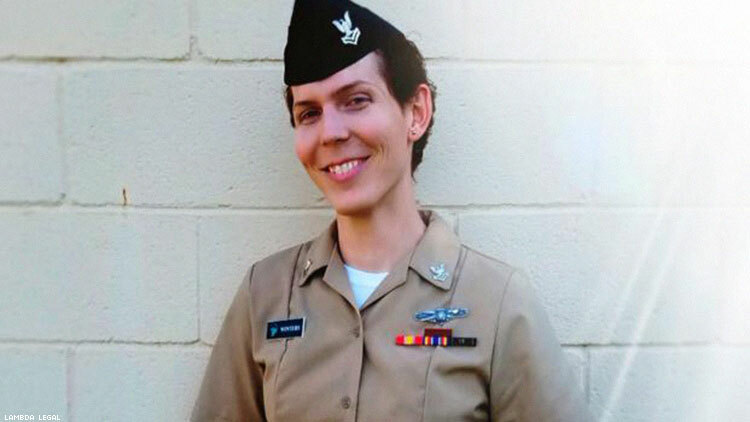 She came out as transgender in 2016, just after Ash Carter, secretary of Defense under President Barack Obama, announced the lifting of the policy that barred transgender people from military service. Then a year later, Trump announced that he was reinstating the ban. It’s been blocked by court orders issued in the four lawsuits challenging the ban, but the Supreme Court recently ruled that the ban could go into effect while the suits are heard in lower courts.